Samsung Galaxy S II, GT-19100, do you own this pretty decent old phone from Samsung which launched in 2011? I had one and I must say I loved that one and one of my friend still using that phone with out any issues. 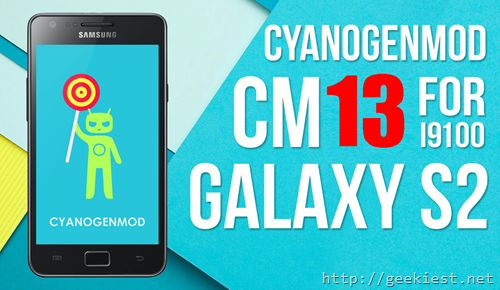 For the Samsung Galaxy S2 users here is a good news, you can get official Cyanogen mod 13 for your device, that is Android 6.0 marshmallow for you. Modifying or replacing your device's software may void your device's warranty, lead to data loss, financial loss, etc. and therefore must be done entirely at your own risk. Some second-generation Samsung Exynos devices are potentially susceptible to a "superbrick" caused by performing a factory reset with the stock kernel, which effectively kills the internal memory in the device. It is highly recommended you do not perform this operation while using a stock kernel for safety reasons. To make sure you aren't running the stock kernel (only needed when coming from the stock ROM), fully install CM without performing a factory reset and reboot to recovery before you perform the factory reset. Update your Samsung Galaxy S2 device to Android 6.0 Marshmallow using official CM 13 for the device.